McLaren have become the first F1 team to unveil their F1 2014 challenger to the press. 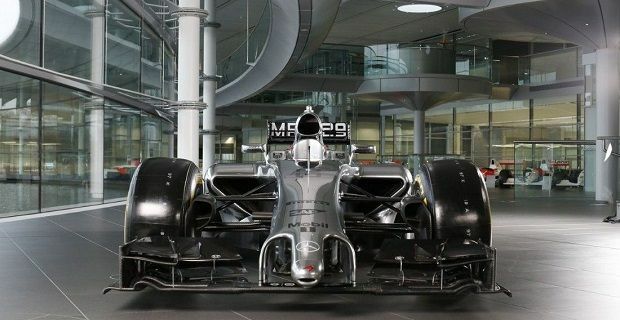 Force India and Williams have released computer generated images of their 2014 F1 cars but the British team have become the first to officially launch their new car, which they’ve designated: McLaren MP4-29. The new machine isn’t very pretty but if it wins races and brings McLaren back to the top of the constructors’ championship it will start to look good. McLaren will be pleased even if the MP4-29 is only good enough to bring them back to the bottom step of the podium as they didn’t celebrate with champagne at all last season. The 2013 season was the worst for the team since 1980, which was the last year they failed to get a podium finish. The 1980 season was the final one before Ron Dennis took charge at McLaren so the 2013 season was the worst under Dennis’ control. The new CEO’s first move was to poach team principle Eric Boullier from Lotus. There hasn’t been any official word on Bouiller’s arrival but we’re expecting McLaren’s press office to make the announcement soon. The press office obviously released information about the new car seen in our images. Let’s hope it’s the worst looking of the new 2014 F1 cars and that the “anteater” nose isn’t a design cue seen on the majority of the 2014 challengers. The new nose is in response to the sport’s new regulations that dictate a lower front end and the team’s need to keep it as aerodynamically clean as possible. McLaren’s MD Jonathan Neale said: "We've never had such significant new regulations before; reacting to them, and managing those changes, while still pushing the performance limits, has been an extremely tough job." F1’s 2009 world champion Jenson Button and newcomer Kevin Magnussen will be hoping that that the new car performs on the race track.